Avoiding plastic in our day to day life seems a bit difficult, but this team did six plastic free shoots and three zero waste and plastic free shoot. “One fine day, I was sitting in my bedroom, wondering how can I do something in a different manner and bring in a change? How can I be the change? I called my team and said, ‘Why not make our work environment more responsible, conscious and exciting at the same time?’ I explained myself to them; we discussed things and came to the conclusion that we will go plastic free. 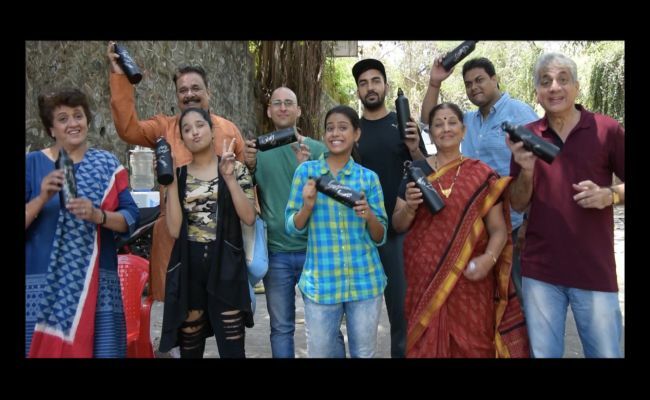 The idea was to not use single-use or disposable plastic on AD and film shoots”, says 38-year-old Akshat Rao, director, and producer at Olive Films Pvt. Ltd. and founder at Earth Inc.
Say I want to drink water, I’ll pick up a bottle, take a sip or two, keep it on side and get back to work. I, just like anyone else on the set will do the same thing every time I need to drink water. Reason being, I’ll keep the bottle somewhere and forget or I don’t know which my bottle is mine as all the bottles are alike. This way, humongous amount of both plastic and water goes to waste. Because of this, we were also paying for the water not consumed by us. Assuming there are 100 people on a set and 10 bottles are utilized by one person, straight away 1000 water bottles are used during a shoot. To overcome this problem, the team installed water dispensers with water cans. This way an individual can take the amount of water he/she requires and not waste it. More than anything it felt like a home. Generally we get plastic bottles at a shoot, but this water dispenser, steel glasses are something we use at home. In this manner, the team has successfully done six shoots. Raising their bar, this year the team thought of not contributing to the existing pile of waste and decided to opt for ‘a zero waste and plastic free shoot’. For this, numerous changes were initiated like, replacing paper/plastic cups used for tea and coffee with cutting chai glasses and mugs. Generally, 400-500 paper cups are used per shoot which cost Rs. 800 whereas one cutting chai glass cost Rs. 7 which means Rs. 700 for 100 glasses. These glasses are durable and can be used n number of times. It is a one time cost or I should say an investment. We can simply carry these glasses with the rest of the production materials, says Akshat. Along with this, the team was requested to not bring in any packaged/processed food and beverages. To substitute this, coconut water and nimbu paani were supplied instead of artificial beverages and fresh fruits were provided as opposed to chips, wafers. It was a healthier move for a healthier body. Snacks that were given were mostly fruits and healthy food and that too in glass jars and bowls. No packaged food on set at all. It felt great, exclaims Akshay, DOP, Lipstick Under My Burka. 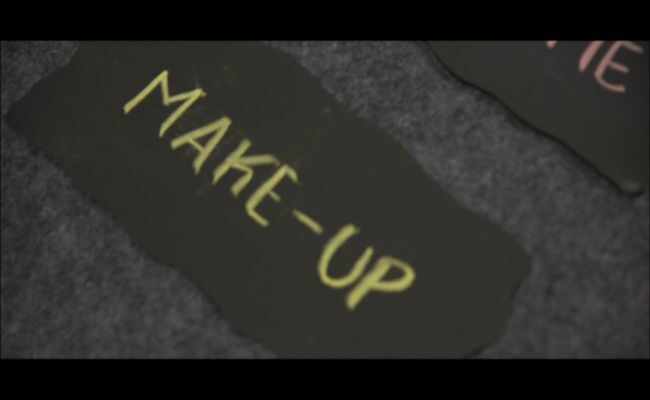 Further, to avoid paper, reusable chalkboards were used as sign boards on set. This reduced the money spent on printing. Reusable chalk boards are very handy and cheap. We carry it at every shoot and make a signboard for anything and everything like make-up room, costumes, so on and so forth, tells Akshat. To promote the idea of zero waste and plastic free shoot, personal water bottles were gifted to cast and crew. 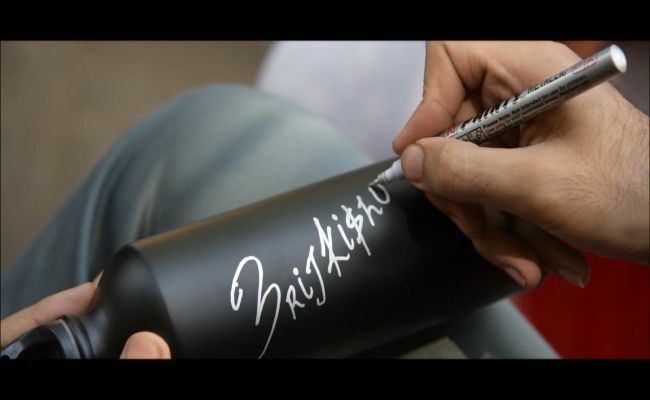 Around 200 bottles were sent to people within the film fraternity to spread awareness about the initiative. On the first day of the shoot we distributed bottles and asked everyone to write their name on it. What happened next day was surprising and motivating. Everyone was carrying their personal water bottle just like we used to carry one in school, tells Akshat. With ‘zero waste and plastic free shoot’ as their mantra, Olive Films has done three shoots so far. The team plans to continue with more such initiatives and make a difference. As a filmmaker, we can take forward this message. If we as a fraternity are able to do something and send across a message then that’s fantastic, signs off Akshat. 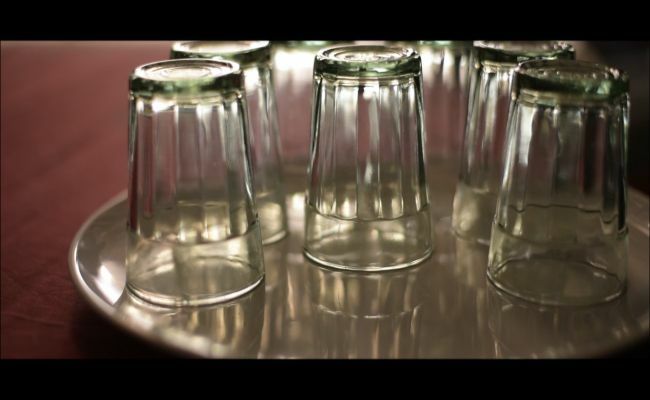 Previous Post: Goodbye Plastic, Hello Creativity: Five Easy Ways To Reuse Plastic Bottles. Next Post: If Waste Management Is Not Done Right Then By 2030 India Will Need A Landfill As Big As Bengaluru.